One of the rarest and perhaps most historically significant bank notes in the D. Brent Pogue collection is the 1861 “For The” hand-signed $10 Demand Note attributed as Friedberg 7a. Demand Notes were created through necessity under the leadership of Salmon P. Chase. Due to the Civil War, gold and silver coin hoarding had severely limited the flow of commerce. Chase concluded that it was critical to establish a viable Federal currency to allow commerce to flow in a wartime environment. The Demand Notes were created to assist in the Union’s funding of the Civil War. Under Congressional authorizations of July and August, 1861, Demand Notes were printed in denominations of $5, $10, and $20. 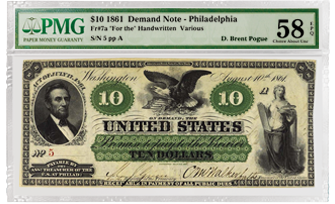 The term “Green Back” originated from the green color of these notes, the first issuance of US federal paper money. Demand Note issuers included Boston, New York, Philadelphia, St Louis and Cincinnati. The obligation allowed the “bearer” to receive the face value in hard money at any of the above “Banking Centers”. Today, all Demand Notes range from very scarce to incredibly rare. The obverse of the $10 Denomination bears the C.S. German photograph of Abraham Lincoln, which was engraved by Frederick Girsch. 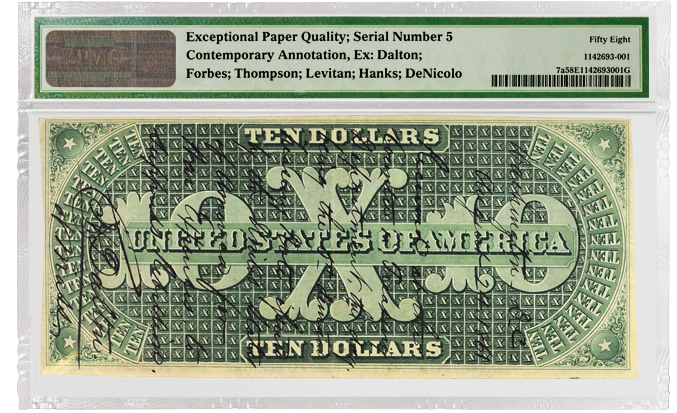 The back of the $10 green back displays a large Roman Numeral X at center with the denomination 10 juxtaposed to the left and right. The Pogue specimen is an extraordinary note. 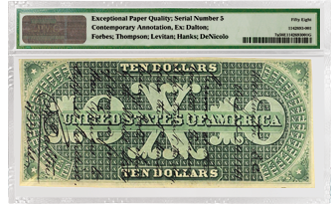 It is not only one of the rarest Demand Notes of all denominations with just three examples known, but at PMG 58 EPQ it is also the finest known $10 Demand Note of any type or variety. This note possesses vibrant color and the high quality signatures bring considerate detail to the “For The” inscriptions that still look impeccable over 150 years later. A well respected individual, C.H. Dalton led an illustrious life and his historical significance is well documented. His duties in the Civil War included logistical movement of all Union goods and supplies, their disposal and distribution. In addition, he was responsible for making payments and dealing with the US Government with regard to the Commonwealth of Massachusetts. Commissioned as a Colonel he was appointed Assistant Quartermaster. After the War, he would go on to be recognized as a superb businessman and humanitarian. He worked closely with M.I.T. and served as President of Massachusetts General Hospital.